Sendings things from one zip code to another can get damn expensive. We have bikes, we have books, and we want you to have books too. Our Velocipedal Dispatch is the solution. It’s simple. Purchase an Anobium product on this page. If you are in one of our eligible delivery areas, we will hand-deliver your book, free of charge. You can also send us an e-mail at editor@anobiumlit.com, stating what you want, and then you can pay us in cash at your door. Like you’re ordering a sandwich. Delivery is free. You pay for the book and nothing else. We can have it to you in less than 36 hours. If your neighborhood is not listed here, contact us at editor@anobiumlit.com. We’ll do our best to make accommodations. 1. Browse the Anobium storefront, note what items you are interested in purchasing. 2. 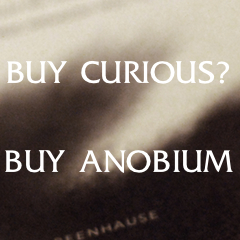 Send us an e-mail at editor@anobiumlit.com, letting us know your address and what items you want. 3. Let us know if you would prefer to pay online or in person. 4. If you prefer to pay online, we will send you an invoice. If you prefer to pay in person, you can pay us in person. 5. Wait with giddy anticipation. What are you waiting for? Order!